With over one million square feet of warehouse space available, we have facilities in multiple locations to satisfy your operational needs. Our facilities can handle storage and handling of goods both seasonally and year-round for a variety of industries. With warehousing services in Kansas City, Chicago, Minneapolis, Milwaukee, and Iowa, our warehouse facilities provide easy and quick access to intermodal hubs and major transportation centers. Your warehoused items are never more than 24-hours away from efficient distribution. 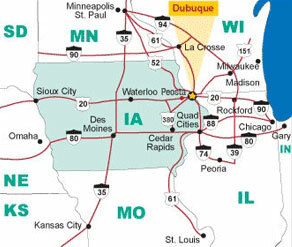 Our Iowa center is located along U.S. Highway 20, positioning Peosta Warehousing Logistics perfectly in the Midwest to allow the best possible response times to meet your needs. The facility’s proximity to the major Rochelle, Illinois, rail yards is ideal for transporting goods multiple times in a 24-hour period. Our facilities are built with pre-cast concrete tilt-up walls and 30-foot ceilings. Each is temperature controlled and include ESFR sprinkler systems, state-of-the-art security, container unloading and cross docking with large staging areas, drive-in doors, dock shelters, and dock doors with levers and restraints. Located in the Dubuque, Iowa, metropolitan area. 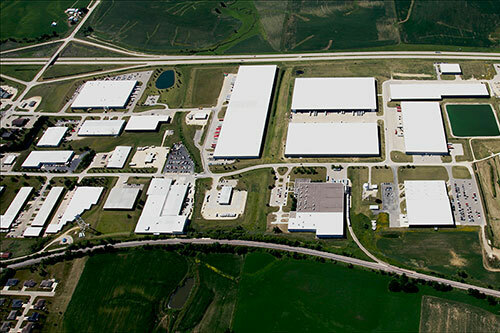 Sparsely populated but within a 4-hour drive to Chicago, the Dyersville facility allows truck drivers and product movers easy access to major transportation hubs without battling congested roadways. It’s a mere 133 miles to a major transportation hub in Rochelle, Illinois, and only 375 miles to Kansas City. Products warehoused and distributed from our warehouse space in Maquoketa, Iowa, also don’t have far to travel to reach some of America’s largest transportation hubs. In a little more than 3 hours, products can be delivered to Chicago via Interstate 88. The warehouse space is only a 4.5-hour drive to St. Louis, the Gateway to the West, and less than 6 hours to major transportation facilities in Kansas City. 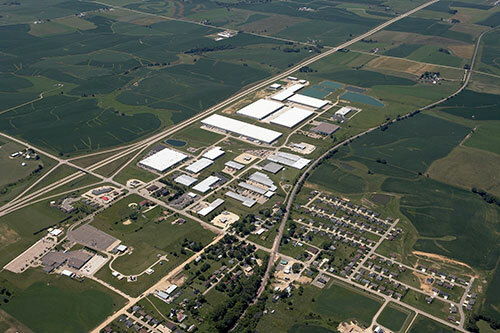 The small community of Peosta has major highway access via U.S. Highway 20, and products warehoused in Peosta, Iowa, are within an easy drive of Chicago, Milwaukee, and other Midwest transportation hubs. Located virtually on US Hwy. 20, Peosta Warehousing Logistics in Peosta, IA is positioned perfectly in the Midwest allowing the best possible response times to meet your needs. Our proximity to the major Rochelle, Illinois rail yards is ideal for transporting goods multiple times in a 24-hour time frame. For companies with distribution points in the Midwest, this creates additional delivery efficiencies not possible with all warehousing and logistic facilities. We have state-of-the art security system to keep your merchandise safe. Our climate-controlled, warehouse center features dock doors with levers and restraints. Large staging areas, dock shelters and drive-in doors are some of the other features of our logistic facilities. We are a trusted company in the warehousing and logistics industry. Our logistic services ensure delivery efficiencies for companies with distribution points in the Midwest. Call us today to inquire about our distribution services!